It's the first day of October, which just might mean it's going to get cooler, cool enough for me to use my oven again! ...Use my oven, leave my air conditioned room, put on clothes that cover more of my bits... not necessarily in that order. The heat has made things a little bit too casual in my house as of late, and I did greet the plumber this morning without putting on a bra. I don't like to be that casual. Fall is a great time to cover up. I adore October. SO DOES EVERYONE ELSE. Pretty unoriginal. Autumn is wonderful and even sociopaths love being cozy. I mean, sociopaths may have a different definition of "cozy," but the sentiment probably remains the same. A lot of people also like Halloween. I so badly want to be a person who loves Halloween for everything it has to offer, but I am not that person. My pros and cons list for Halloween is balanced, like the scales of us Libras born in this month. - Being scared is sometimes super fun -- I prefer spooky stories, ghost tales heavy on historical facts and light on gore, just enough to make it hard for me to look at the mirror in my room when I go to sleep. When I was little, I used to be pretty into witches -- once, my mom brought me to a crystal shop in St. Paul that she told me was run by witches. I made a lot of dubious and sustained eye contact with the ordinary-looking women who worked there, not totally convinced since none of them looked like Angelica Huston. Now, I'm pretty into Stevie Nicks, which I guess is the grown-up version? - Movies like Hocus Pocus! To fall asleep as a kid, I used to daydream about the Sanderson sisters visiting me. Again, very interested in witches. Didn't care at all about what happened to the kids they tortured. - Fun-size candy that defies portion control and leaves you stuffed with 27 mini Kit Kats even though you'd never think to sit and eat a full-size Kit Kat at any time. - Adorable children roaming the neighborhood. I would really like to always be greeting children. - Getting to ask people, "What are you supposed to be?" and they think you're talking about their costume when in reality, that is sort of a fair question year-round. - Being scared is sometimes NOT super fun. There was a year when my ice rink, Parade Stadium, hosted a "haunted house" in the locker rooms. The smell left behind by the hockey players should've been scary enough, but they had older kids hide in the bathroom stalls and grab the ankles of passersby in the dark. Honestly, thinking about it now, it sounds pretty lazy? But then, as a... 9-year-old?... it was a true nightmare. One ankle grab sent me over the edge and I ran out of the locker room and out of the building and didn't stop until I was outside and the sky was blue and I felt safe again. Luckily, my ice skates had their guards on them, so any permanent damage was only emotional. I haven't entered a haunted house since. It all sounds pretty unnecessarily awful? I'll be the one holding everyone's purses outside, thanks. - Someone was stabbed to death outside of my Union Square dorm in 2007 as part of a gang initiation and the perpetrator wasn't caught because of costumes and parade chaos. - I have enough trouble putting together normal outfits for everyday life. Costumes are a lot of pressure. The best costume I've probably ever worn was part of a group situation with my college improv troupe, Dangerbox. 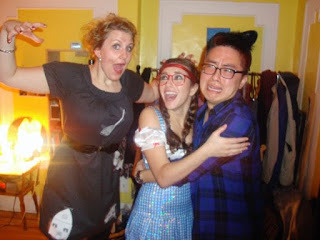 We dressed as Hipster Wizard of Oz (and this was 2009, so "hipster" was still prettttty fresh, you guys). I was the tornado. We really killed it at that one Brooklyn party we attended, especially considering we found an empty bedroom and hung out with only each other for the night. My ideal Halloween involves being curled up in front of a psychological thriller, most lights off, waiting for trick-or-treaters and obsessive-compulsively eating odd numbers of Milk Duds from their tiny fun-size boxes. If this sounds good to you, please make plans to join me. As evidenced by the above lists, I'm loads of fun. But doesn't this evening sound charming? Cozy in a non-sociopath way? Lest I jump the gun on autumnal delights... here is a one more icebox cake recipe, for that one more weekend of heat LA is probably going to get. Luckily, it's delicious. Eat it on Halloween, too -- why not? As long as you're not wearing a mascot outfit, I approve! Lay graham crackers on the base of a 9x13 pan. Layer whipped cream and strawberries on top. Layer graham crackers --> whipped cream --> strawberries, until you reach the top of the pan. Cover and refrigerate for 4+ hours. The graham crackers soften to something more appetizing than "moist" or "mushy." It's almost cake consistency, but without turning on your oven and sweating into your ingredients. Like magic!